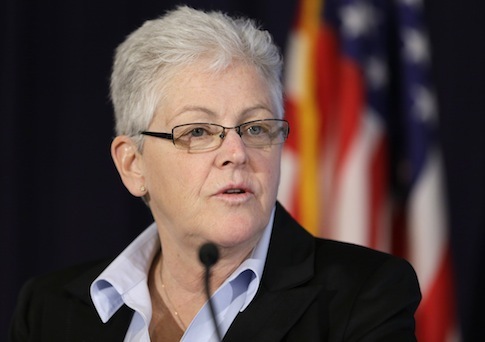 A conservative Washington, D.C., think tank filed a lawsuit against the Environmental Protection Agency Wednesday to obtain text messages from EPA nominee Gina McCarthy. The Competitive Enterprise Institute (CEI) filed the lawsuit to obtain text messages sent by McCarthy during testimony she gave before Congress on 18 separate occasions. CEI filed the initial Freedom of Information Act (FOIA) request in April, but the think tank said the EPA has not turned over the records. McCarthy, head of the EPA’s office of air and radiation, has been tapped by the White House to be the next administrator of the nation’s top environmental regulator. CEI said it initially requested the text messages "after being credibly informed EPA warned her to stop texting and that the messages she was sending about members of Congress during hearings posed great risk to her and the agency." Information on mobile devices is subject to the Freedom of Information Act, according to the EPA website. "Yes, information on your mobile device may be requested under FOIA or in response to litigation," the website says. "The same exemptions apply to the release of the information that apply to all other EPA records." CEI has filed numerous lawsuits against the EPA to force disclosure of records, including emails from former EPA Administrator Lisa Jackson’s secret alias email address, "Richard Windsor." CEI senior fellow Chris Horner, author of "The Liberal War on Transparency," first discovered Jackson’s alias in November. Subsequent discoveries revealed several high-ranking EPA officials using private email addresses to conduct government business. The EPA inspector general is currently investigating the agency’s records management practices. The inspector general is also investigating claims the EPA refuses to waive public records fees for conservative groups while granting the waivers for environmental organizations. Acting EPA Administrator Robert Perciasepe said he is working with the inspector general to audit the agency’s FOIA office. Perciasepe released a memo in April vowing to improve the agency’s FOIA compliance and records management. "While we have made progress in these areas, we are committed to addressing any concerns or weaknesses that are identified in this audit and to working collaboratively to strengthen our records management system and policies," Perciasepe wrote. The EPA did not immediately return requests for comment. This entry was posted in National Security and tagged EPA, Gina McCarthy, Lisa Jackson, Obama Administration. Bookmark the permalink.